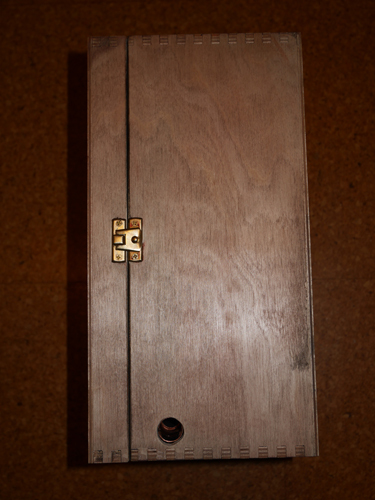 I gave the box (smaller than visualized...) a quick coat of stain and thought about design. My engineering and woodworking skills aren't the greatest, but I used to make models as a kid and decided that maintaining an aesthetic would be the best option for a small space. 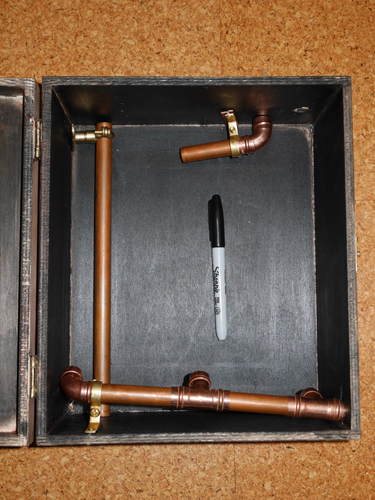 With a bit of spare copper pipe and a few fittings left over from a boiler replacement I decided an industrial feel would work - hopefully the finished project will have a slight 'steampunk'/'mad scientist' feel. Two holes drilled (one for the inlet pipe and one for the outlet), I'll use the lid to store a removable release gate and capture/finish line piece (having a hinged bridge and using the lid as part of the run was an initial idea). The interior has been painted black to increase the illusion of depth and set off the metalwork. The outlet pipe and inlet pipe have now been roughly positioned. Hopefully the pen shows the small scale. The downpipe needs to be fixed and will form the core of a a coil for one of the three paths. Small is also what I was envisioning for my project .... for when I ever got started. Because of space and cats! Maybe small enough to fit on a desk. Putting it in a box is not something I'd thought of. I have some slightly larger but easily portable salesman type cases. Salesman cases sounds like a good idea. I've got a few ideas on how to slow the descent down enough to hopefully make the runs interesting but I keep daydreaming ideas that aren't practical when I go back to the box and it's small size! Making the release ramp removable does give me the option of stacking a second self contained box on top with a switchable exit that could be a hole in the floor to this one allowing the combination of two models. 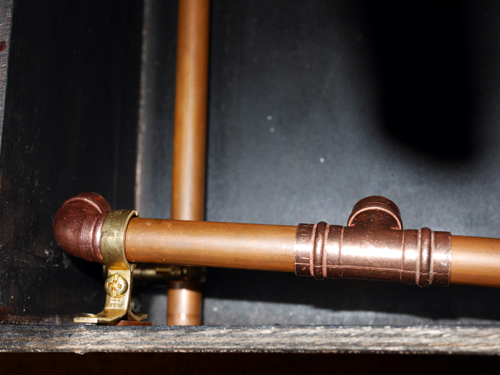 The runs will be a mixture of wood, brass sheeting, copper rails etc. which should add visual interest. I'll add a few more photos once I've done more work. It tends to be 15 minutes here and there so it will take a while. I'm curious in the end result! 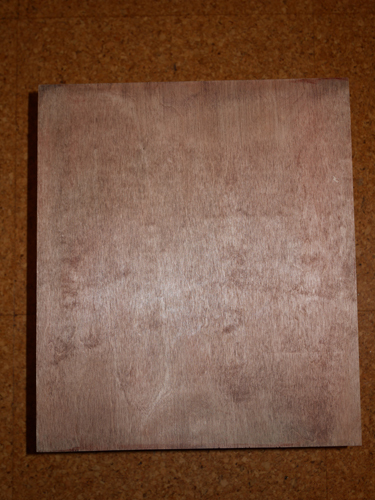 Would it be an idea to use cleaned wood scoops of iced-lollies as base to make your switches? Maybe this reduces the effort with the hand-saw? Getting them clean is quite easy, just throw them into the cutlery container of your dishwasher next time. Why do you need coils made of copper tubing? Might it be an idea to use copper or brass wire instead of tubing? Solid material is far easier to bend without special equipment. Electrical installation wire (not the flexible kind) you might use with or without its insulation around. I personally prefer 4mm aluminium rods from the DIY store for several reasons - one is that I can bend it on an (old) cooking pot. But I must confess, I never tried to wind a narrow spiral of more than one turn with these rods. It might work with copper wire 1,5² (has roughly 1.2mm in diameter) and a coil former core of appropriate size - when you are ready with the coil it will widen up a little bit and thus let the core out without a hazzle. But I think you have some experience already. To use 16mm balls for me just was natural: All the marbles I already had in those days had this size. The smaller the balls the smaller the tracks need to be, the bigger the balls, the track manufacturing precision is getting less important but the tracks need to get more sturdy. PS: Some issues might take months to get tracked down to their root cause. Other's are visible at once. So do not despair of work getting stuck. It will only take some time to get a solution. I tried both 4mm copper pipe and some 3mm copper wire - I could form coils that looked okay, but couldn't get the precision. I might try thinner diameter wire and make some kind of track spacer. I hadn't realised the precision needed for the small balls. I've got some thin brass sheeting that might be an easier option - curved ramps won't need the same level of precision. Ice-lolly sticks for the switches is a good idea - they should be shape able by knife (I'm not precise enough with a saw). I was thinking carved balsa wood soaked in superglue to strengthen might work too. I'll probably use a mixture of switches and simple split paths - I didn't want to just rely on a split path, as my gut-feeling is that the route taken is likely to be far from random - however central I get the split. I think I'm going to have to with either two or four main paths if I want to evenly split them - 1 switch will give 2 paths, 3 will give 4 paths, but 2 switches would favour 1 path twice as much as the others! After you finished sawing you might file / rasp the edge to get it more smooth. I prefer to sandpaper my wood pieces with grain size (correct?) 80 to 240. Sandpaper or abrasive cloth is so wonderfully flexible for these jobs I prefer it over any file. If you need a precise flat edge, it might be an idea to pin the sandpaper on a tabletop (a small board will just also work) and then rub the piece of material against it as long as necessary. The sanded piece then gets as flat as a pancake. I am really curious about how your switches will look alike when you finished them. A practical use could be a device that is not capable of high throughput to be placed in the sparsely populated track. I nearly forgot: your downward coil is quite more complicated then it looks later on! The more your marbles descent, the faster they get. The faster they get, the more banking they need to stay on the track. Maybe it is not the kinks alone that throw out your marbles but also just the speed and the tiny radius? I shall continue to experiment. Building it in a box whilst helpful in terms of providing support for the tracks is now presenting the problem that I can't simply build bottom up, I've got to work out accessibility at the rear. It's a fun learning curve! Once there's a bit more to show I'll update the photos. At the moment they'd mainly be of failed attempts to evenly coil copper tubing and copper wiring, and lot's of pieces of distorted brass tooling foil! On the positive side I've filed out the join on a miniature funnel (the sort designed for filling bottles/hipflasks etc. 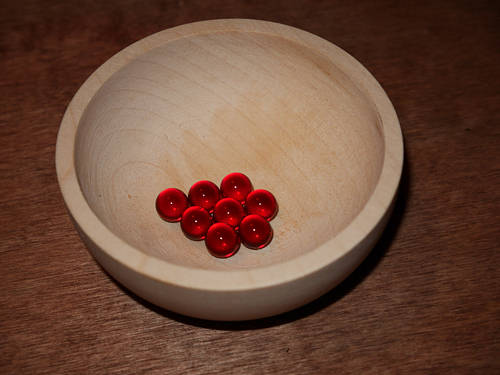 )and found a wooden bowl from a child's tea set that will make a decent spinner. 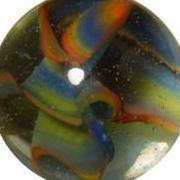 8mm glass - probably Czech and designed for jewelry or crafts rather than true marbles. 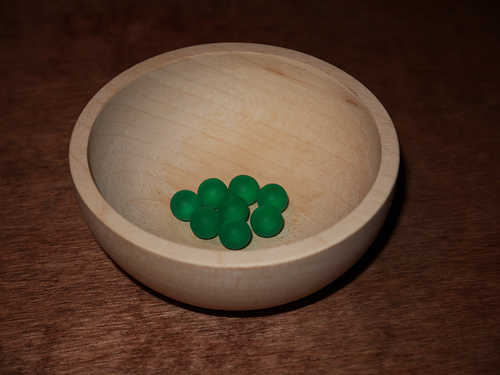 The bowl will be drilled, stained and waxed to form a 'spinner'. Why do you need the weight of steel balls? The switches? Yes (although as I haven't got to the switches yet I may be worrying over nothing). I see. My estimation gives roughly 0.67g per 8mm glas ball - oops, this is pretty few. 16mm glas balls roughly have 5.3 g which is pretty well enough for a switch. 8mm steel balls roughly give 2g each. Maybe you just build some switch models outside your box to find out which construction works well with 0.67g. You are really creative here. Playing around with the spinner now I've drilled and stained the bowl, the extra weight of the steel balls work slightly better (I also realised I need to give more thought to the speed the balls enter at - the entrance needs to be at a very shallow angle to get a decent amount of revolutions, but the ball needs to be travelling at a reasonable speed). A fact is that steel balls will spin longer in bows than glass marbles. 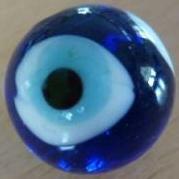 However, glass marbles can have nice colors, but their roundness is not always perfect. In my marble runs, i also note the irregular roundness of marbles by adding more (or higher) rims and a better slope. 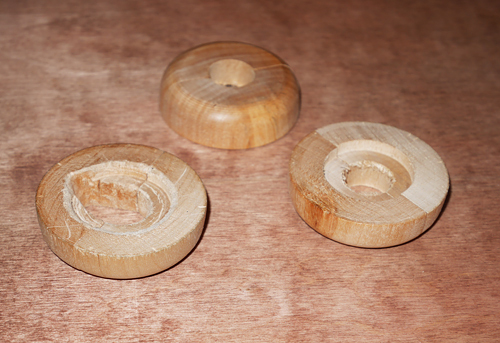 However, lightweight switches (made from MDF or light wood, or iron wire) will work quite good with glass marbles. Thanks - the 8mm marbles have very little weight, but I suppose if I get the pivot smooth enough they should work. Definitely. Friction of the pivot bearing is crucial here. Extremely lightweight constructions even could use paper for the tilting lever device. Dedicated to your bowl: the entrance needs also to be adjusted so that the ball will not hit it after its first round otherwise it looses much energy (velocity, height) and this reduces the spinning time. The walls of the bowl - their inclination - together with the banking formula give you an estimation on the necessary entry speed. The exit hole could get a sources of issues, too. Having it as small as possible gives the best effect until the ball disappears but causes blocking when two or more balls arrive simultanously. Here the timing of the balls arriving at the bowl needs to get adjusted well. Thanks. I drilled the exit hole 1mm smaller than the ball, then gradually filed it until the ball just went through. No blocking with a practice set up but it's a possibility - I might try a short 'pinboard' section before the entrance pipe/ramp. I did discover that too much velocity caused the bowl to act as a ramp. There's a ball bearing in the spare room somewhere The small ball scale and wood grain gives some friction issues - I might need to varnish/wax the bowl.